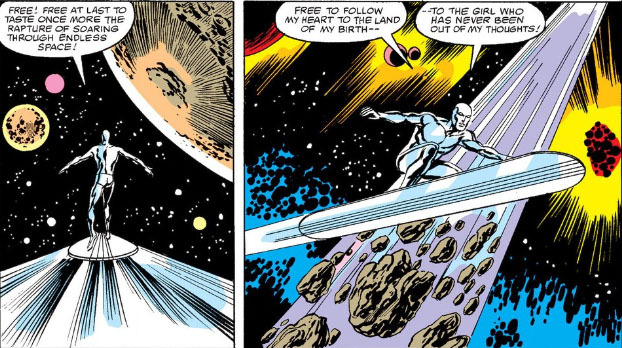 And finally, the Surfer soaring over Earth again. 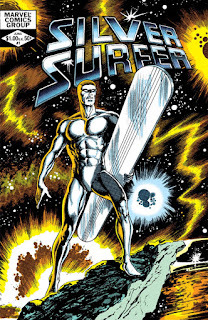 So we can probably conclude that the Surfer escapes imprisonment, returns to his home planet to find it a dead world, discovers his old enemy Mephisto has taken the one he loves, the Surfer battles him, and whatever complications have come about during the story end up resolved or at least are dealt with satisfactorily. 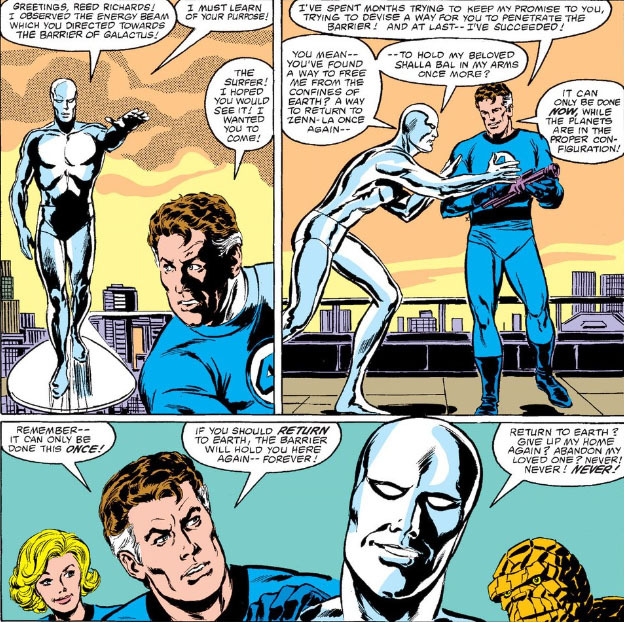 But that's a terribly distilled look at this issue, which is really a fun read back when the Silver Surfer was a very simple formula to write: a former herald to Galactus who is confined to Earth, a planet which holds no future for him and is populated by a human race which spurns him. And it's written by the person who refined that formula to the standard it remained for so long--Stan Lee, whose scripting of the Surfer here is like he'd never put him aside. And Lee is teaming up with the penciler/inker artist team of John Byrne and Tom Palmer, all three of whom craft a vintage Silver Surfer tale and pack it into a whopping 48 pages. 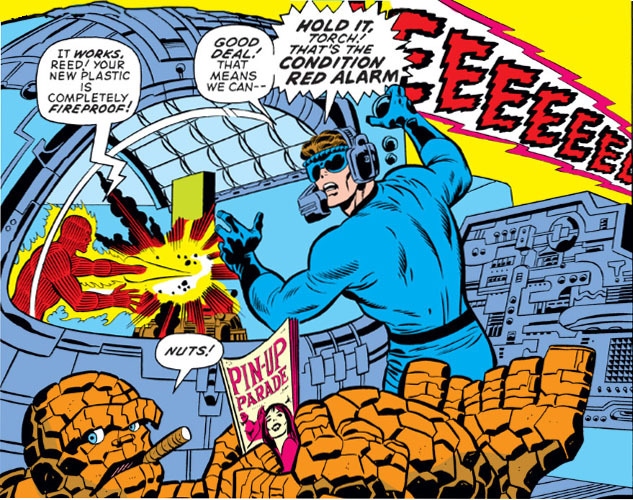 Yet in this story, the Surfer breaks from that formula and is granted his heart's desire when Reed Richards, leader of the Fantastic Four, informs him of a breakthrough. 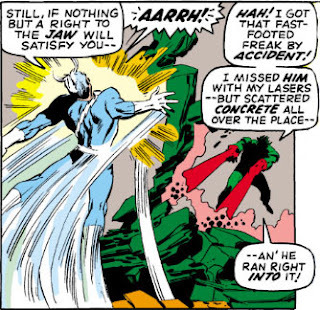 And since we all know how smart Reed is and how he's no doubt double- and triple-checked everything down to the micro-detail, let's just cut to the chase and experience the Surfer's elation at his newfound freedom. 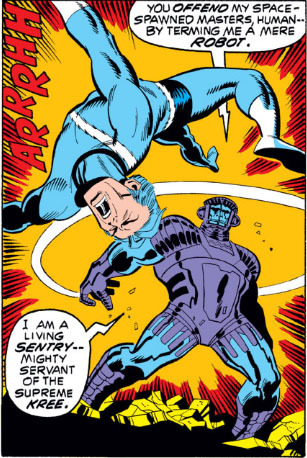 If I'm remembering this point in time correctly, this was the first story where the Surfer had actually been able to escape the barrier of Galactus for "real" (i.e., to mesh with continuity for the character), so that alone made this issue intriguing reading. 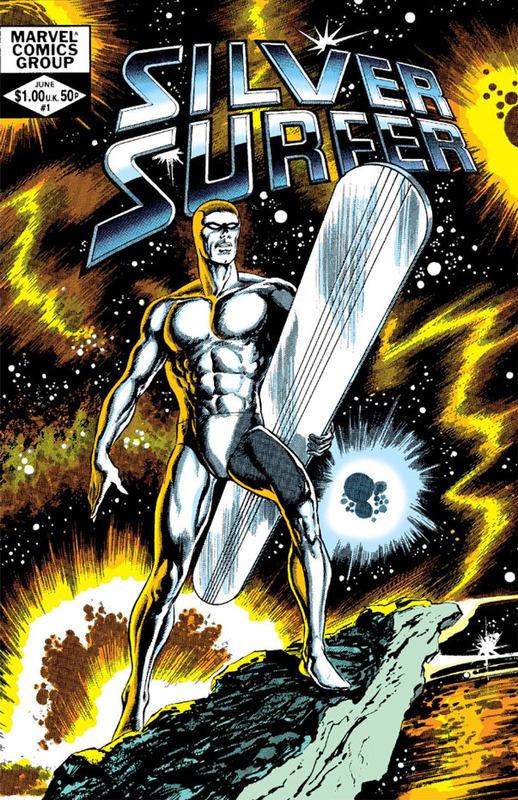 He'd broken through or otherwise bypassed the barrier at other times, by methods which were often only temporary in nature and usually carried some hook which attached conditions or unexpected complications to his escape; but here we finally see the Surfer free and clear, at last. Of course Reed's warning is still ringing in our ears, so it's likely those complications are still waiting in the wings. Nothing Personal, But Kindly DIE-E-E-E! 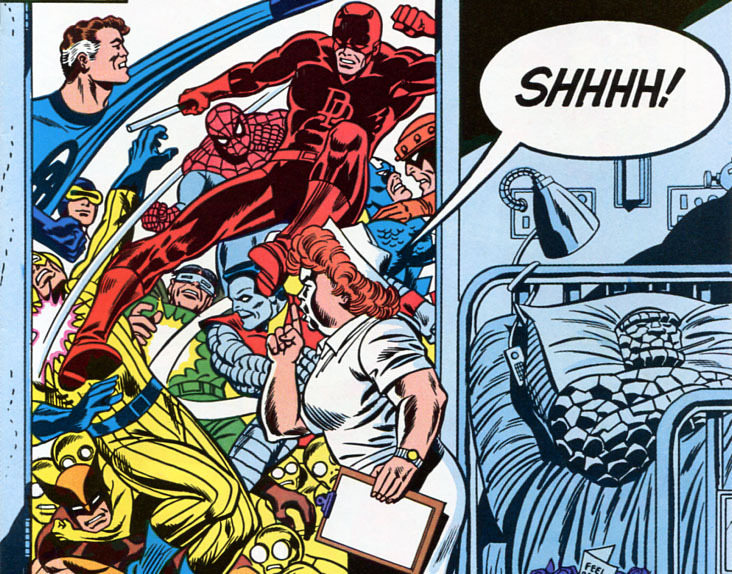 What's your favorite pain-associated comic book exclamation? But come on--doesn't one come to mind almost immediately? 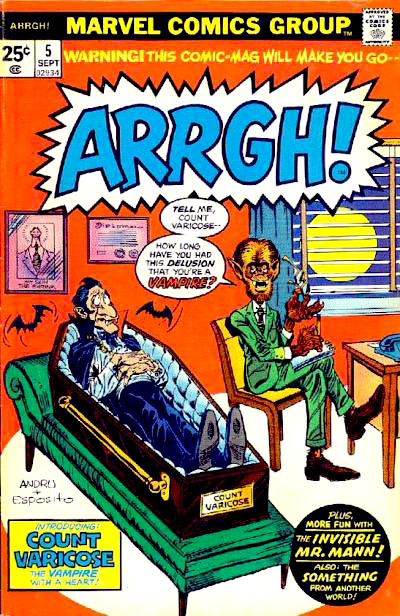 But the original "Arrgh!" will always hold a special place in this fan-boy's heart. 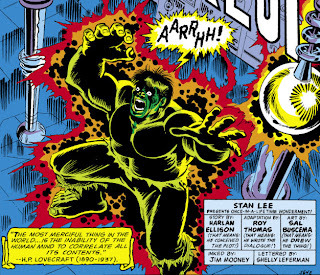 I mean, how many exclamations do you know of that merit their own comic book? 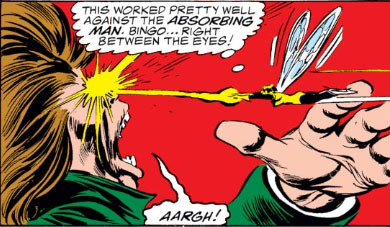 Given his power level, you'd think a being like the Stranger would have received more exposure in Marvel's line of comics. 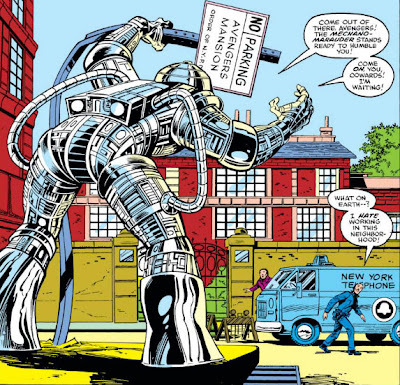 But all things considered, he's been used relatively sparsely--perhaps because there aren't many in Marvel's lineup who can give him a run for his money. In his first appearance in X-Men, that wasn't really a problem since, as he states, he was just a "stranger"--from another world, yes, and someone with a purpose on Earth, but he didn't come to conquer. He was more enigmatic than menacing, though clearly someone who would have no trouble taking the X-Men, Magneto, and any other presumptuous threat and making a paper necklace out of them all. 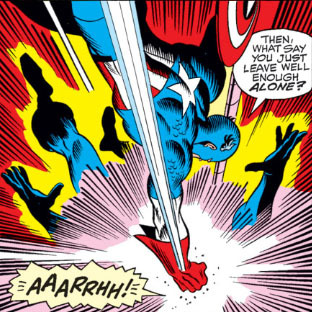 The Stranger's aspect of menace would quickly evolve from this first appearance; I suppose it would have to, if Marvel wanted to keep on using him. 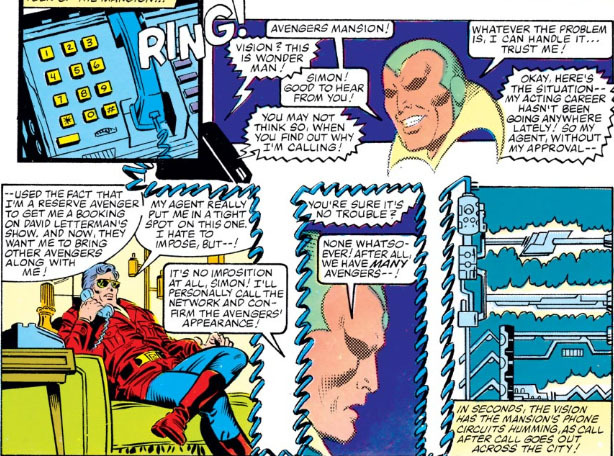 I can't help but compare the Stranger to Thanos, also a being of great (if vague) power, as well as someone who also made considerable use of technology and machinery to assist him in his goals--and certainly both their reputations preceded them. 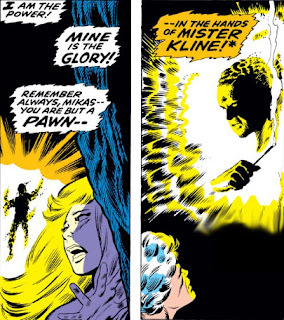 Thanos wasn't nearly on the level of the Stranger in terms of sheer power--he was developed differently, coveting power and death while the Stranger's focus was limited to whatever world or being caught his probing eye. 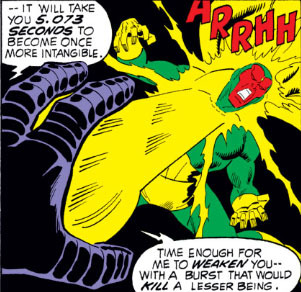 And while both had an imposing presence, the Stranger took on a more haughty air and tended to be more aggressive, while Thanos' rage would usually appear only when finding himself set upon in battle. 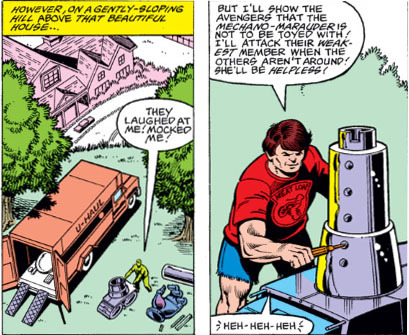 To have a full appreciation of Korvac--a somewhat minor character who became an embittered villain courtesy of the Brotherhood of the Badoon--it's helpful to realize how far he progressed from his status as a mere collaborator of that invading race. 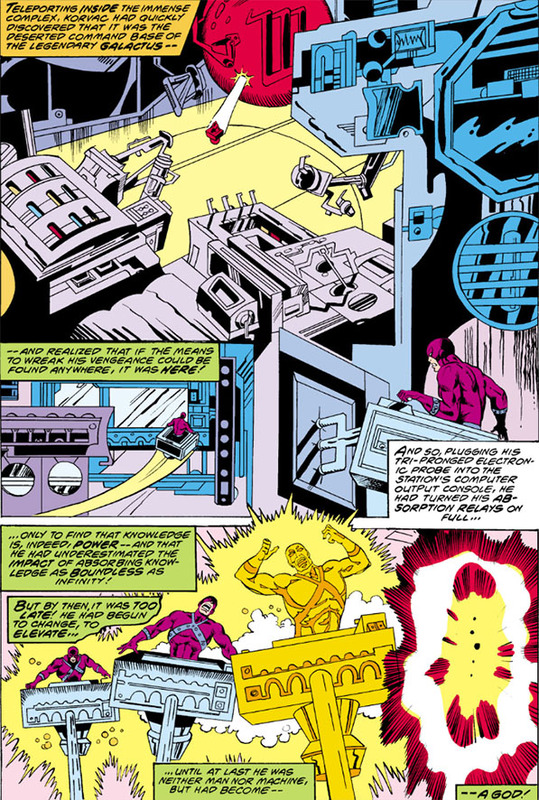 First, physically merged with a computer module as a form of punishment for, of all things, falling asleep at his console; then almost immediately conscripted as a pawn in one of the Grandmaster's games (against the Defenders); and then escaping to the 31st century and gathering his own forces to become a considerable threat. And one bordering on madness, at that. 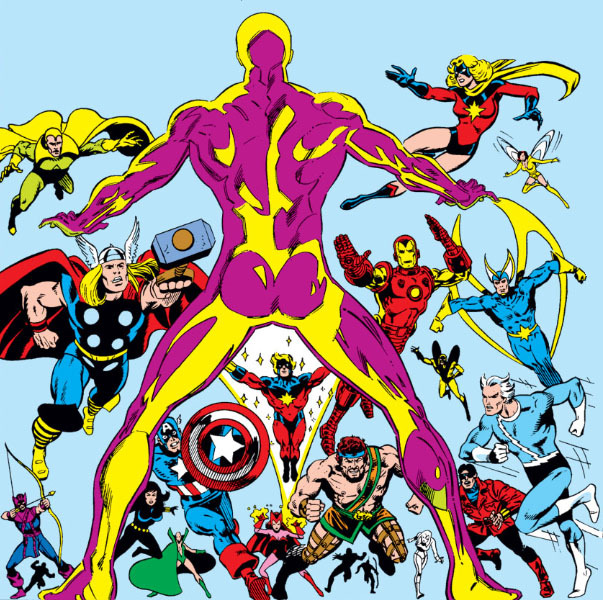 But after coming into conflict with Thor and the Guardians of the Galaxy, Korvac escapes again through time and lands in a location that brings about a startling transformation and sets him on a path to becoming one of the Avengers' most deadly foes. 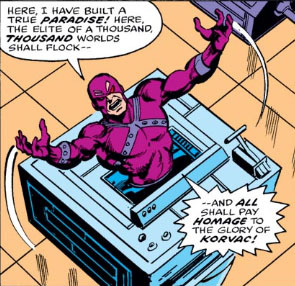 Korvac's purpose then turned sharply from his maddening lust for power to one of universal order--"correcting the chaos, healing the injustice that civilization had heaped upon a battered universe." Which sounds pretty good when you put it that way, doesn't it? 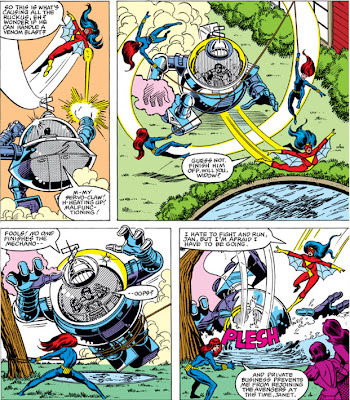 But it resulted in the mother of all battles between Korvac and the Avengers, where the team barely escaped its total destruction. 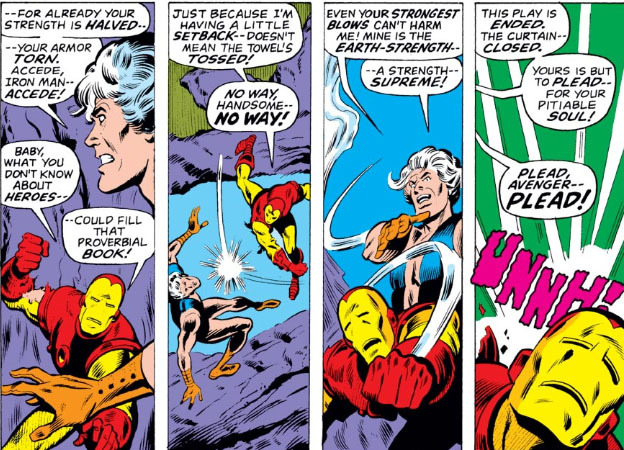 The ending of that story, thanks to the conclusions drawn by Moondragon, called into question the Avengers' actions in battling a being who had only our best interests at heart (at least from Korvac's perspective). Those ponderings were left unanswered with Korvac's death, with Moondragon making sure that only she carried the full memory of what had taken place. 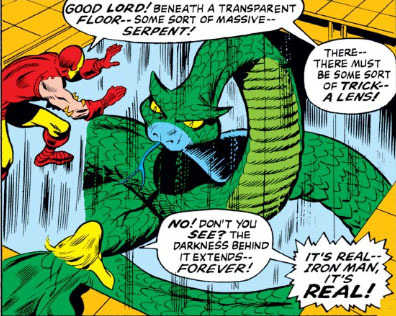 But thanks to a follow-up story in the What If? 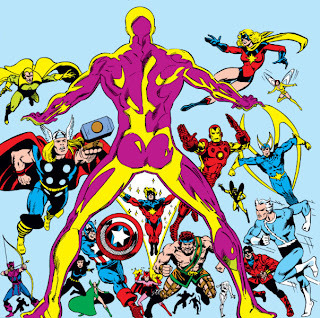 title, we can explore the what-might-have-been scenario of Korvac's plans to at last bring closure to what's been known as the "Korvac saga." 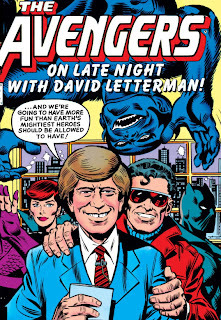 A somewhat misleading title, since the Avengers are dead. And you think you've had a tough day. Mister Kline, ladies and gentlemen. He's not who he appears to be. Nor will you care, one way or the other. 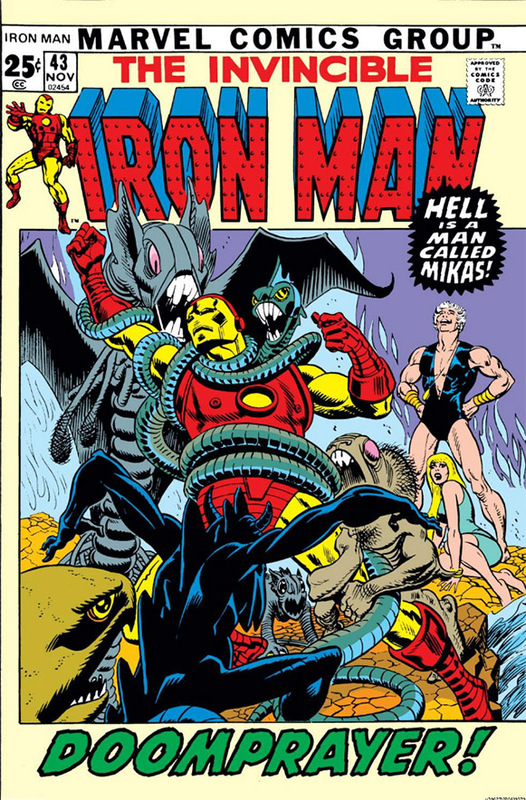 Mikas has the dubious distinction of heralding Iron Man's first large-format issue that Marvel experimented with in 1971. 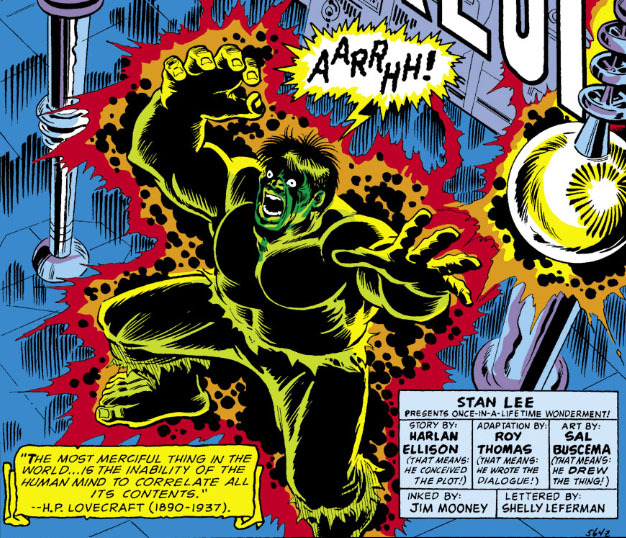 Since all titles in this format were released at the same time, Marvel presumably wanted to put its best foot forward with each mag--which is one reason why this issue is disappointing, because it arguably didn't meet that expectation. 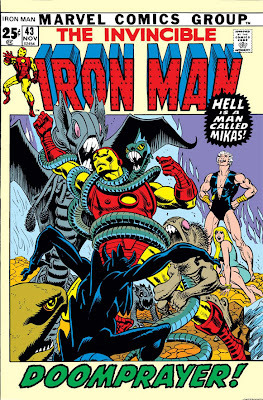 Given Marvel's press on this format, I think readers were really expecting these titles to take it up a notch--but this issue of Iron Man got the short end of the stick in that respect. 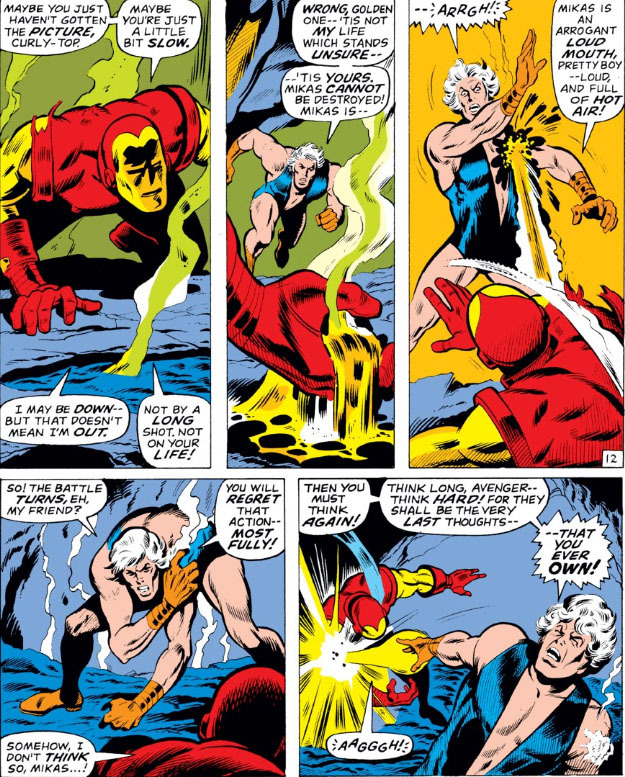 For one thing, "Doomprayer" is a regular-sized 20-page story--the rest of the issue is filled with a reprint of an old Giant-Man story from 1964. 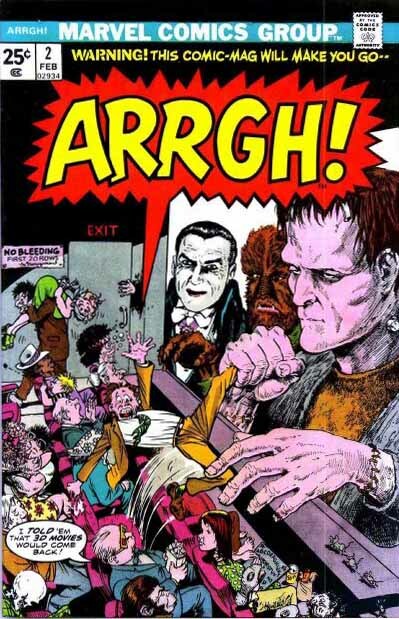 You don't exactly come away from an issue like that ready to plunk down change for the next large-format issue. 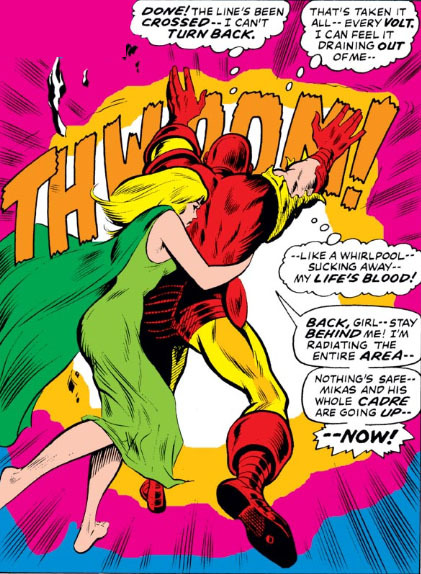 Which brings us to another point: Iron Man may be having trouble with Mikas, but he could probably give the Energizer Bunny a run for his money. 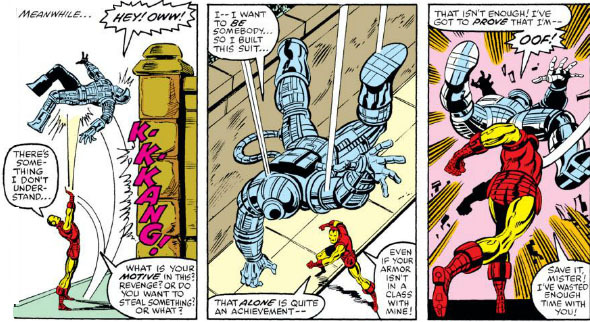 Because since this battle began, Iron Man's power has been drained and he's running on empty--yet he still manages to make power plays with his strength, his boot jets, and his repulsor rays, all while whining about how he doesn't have any power to wage a battle. This guy's unknowingly solved our energy independence problem, because he's obviously found a way to draw a lot of power from powerless circuits. If I ever find myself low on power, you'd better believe I'm running a cord to this guy. Near the end of the Marvel Two-In-One title, there was a story where the Thing was recuperating in a hospital from injuries sustained during two particularly brutal battles. 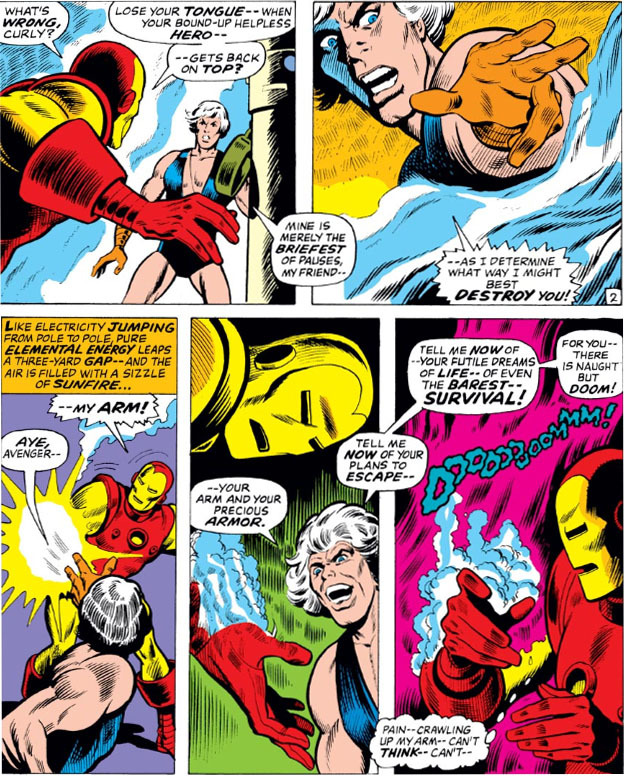 But along with the visits Ben Grimm received from his many comrades-in-arms, there also came calling a number of villains who saw a golden opportunity to take down one of Marvel's charter heroes while he was vulnerable to attack. 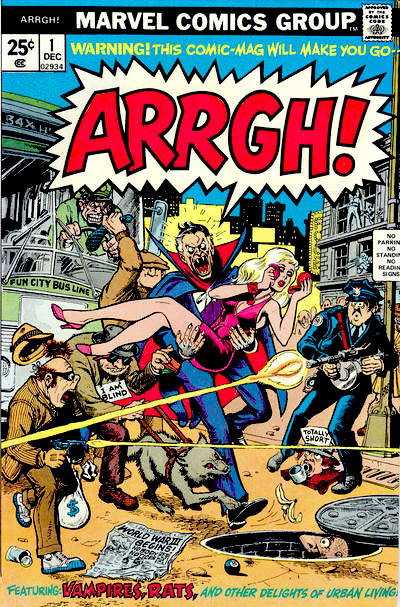 Now, I ask you: given this opportunity for notoreity available to any small-time villain looking for a fast track into the big leagues, what loser do you think is going to try to seize the day here and regain face? 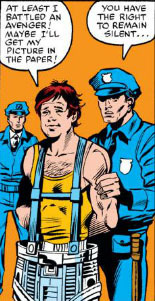 But even though Fabian is left contained and swinging in a thick coating of webbing, he's no doubt vowing to return with a more foolproof plan. Maybe someone should tell him at this point just who that fool is turning out to be. 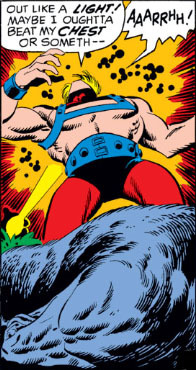 Wow--looks like Thor's in a heated battle on Earth! What could he be trying to stop? The Wrecking Crew? A troll invasion? 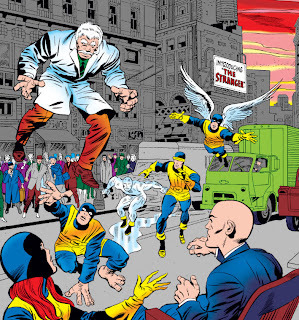 Evil mutants? 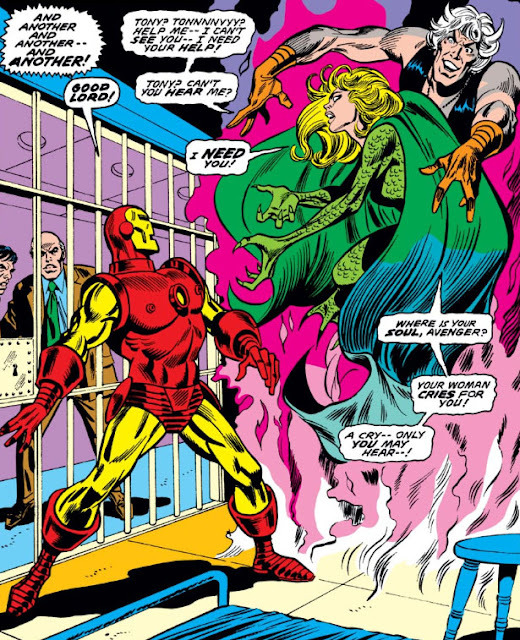 Skrulls? I don't think we need to preamble here. Why don't we just go to Condition Red, okay? Good lord--what could have been so taxing to the mighty Avengers as to send Jarvis hustling to the medicine cabinet, so that he could have a tray of aspirin at the ready as soon as they got off their elevator? 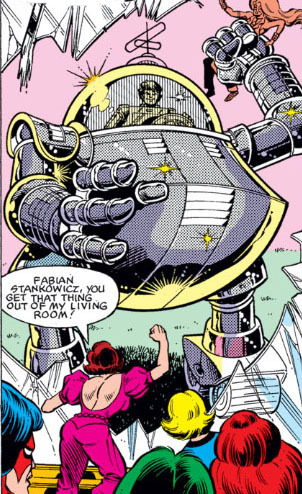 It wasn't the return of Fabian Stankowicz, but perhaps a situation just as annoying and unexpected. Not to mention potentially embarrassing. The next time the Avengers face his awesome might (assuming they ever did the first time), it's at a house party where the Wasp is entertaining some girlfriends she's approached for Avengers membership. 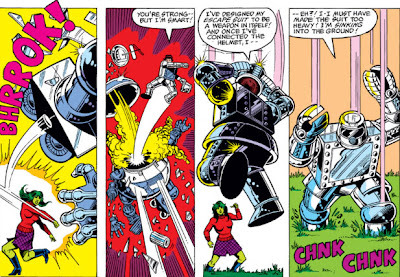 And as the hors d'oeuvres and pastries make the rounds, the Mechano-Marauder STRIKES! 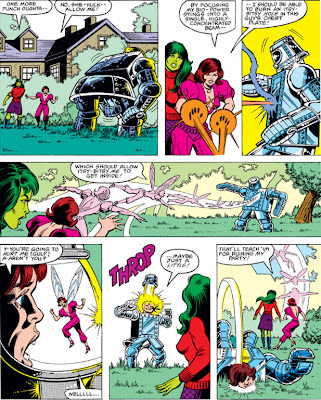 She-Hulk, by the way, goes on to become accepted for Avengers membership in this very issue. 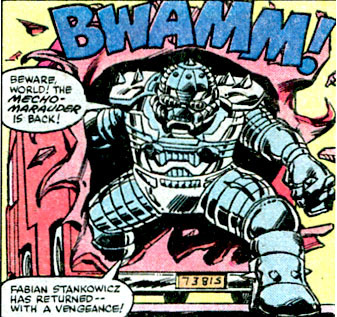 But while the "Mechano-Marauder" may have been a bust, the Avengers may not have seen the last of the his dynamic alter-ego, Fabian Stankowicz. We'll catch up with him again soon enough.